Pancakes are big news throughout Eastern Europe, but these particular ones from the Czech Republic are marvellously fluffy and puffy. Based on potato and filled with spinach, this is not posh food, but it does make a fine and comforting supper. To make the pancake batter, cook the potatoes in their skins in lightly salted, boiling water. Strip off the skins, then pass the potatoes through a ricer or mash and rub through a sieve. Sift the flour and baking powder over the potatoes; beat in salt and a little milk until smooth. Whisk in the eggs and the remaining milk to make a very thick, smooth batter. If you're using fresh spinach for the filling, cook in the usual way then drain, pressing to expel as much liquid as you can; if using frozen, let it thaw and drain. Chop roughly. Put into a pan and sprinkle over the flour. Stir over a medium heat, then add the crème fraîche. Stir and simmer for 3–5 minutes till creamy. Season with salt, pepper and a little nutmeg. In a 20cm frying pan, warm enough oil to cover the base over a moderate heat. Ladle in enough batter to cover the base of the pan, and cook until bubbles emerge on the surface and the pancake is nicely browned underneath. Flip over and cook for up to a minute more. Spoon some of the spinach mixture down the centre, then fold one side over and turn out onto a plate. Repeat with the rest of the batter and spinach. Eat immediately. 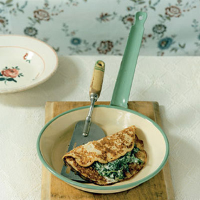 The musky flavour of spinach needs a clean, herby white with crisp acidity.